Discussion in 'Forum Introductions (Who are you!?)' started by Felix H, Jan 21, 2019.
as suggested I will write a short(ish) introduction about myself. My name is Felix and I am a project manager/researcher at a young company that has a focus on advanced sensor technology (bio, health, medical, gas, etc.). I am in the final steps of finishing my PhD in biophysics (the thesis is written and the final corrections are done, afterwards I have to defend and it is over). It was always a dream for me to own a company by myself, to be independent, free from a 9-to-5 and I was thinking about it a lot. One of the main reasons, why I studied was actually based on the fact, that I just couldn't figure out what to do with myself. (Unlike in the US the universities here are free, except for some semester fees that range between 1 to 1000 Euro for a semester). Since I have a twin brother and I couldn't stay living at home (no university around) we both moved to a city where we could study (different fields though). Studying was fine. There is a lot of free time and the possibility of personal growth, I never had any issues with any courses, and a lot of stuff came easy for me (bragging, I know…). However, the university that I was enrolled in is not a top German university, so maybe that is one reason for that. Anyhow, after I was done with my bachelor studies I still couldn't figure what would come next. I was stupid enough to waste my time with video games and watching TV, rather than doing anything towards my own business. As often I was just dreaming about it, but not translating anything into action. So naturally I started my masters. Pretty much the same happened again. Studying was not particularly hard and the procrastination continued. Since the masters was only half the time of the bachelor studies the end came quite fast and yet again, I had no clue how to proceed. But this time was a bit different. I met my future wife while working in the lab. She had a position for a couple of years (she was a post doc already). I had a good connection with my supervisor and so I started my PhD position with him (I had to wait for one year that I spent working). There would have been the next great opportunity to start something but there was no F* It Event in sight. Life was not bad, I was earning some money, I was with the girl that I loved and I knew that there would be the PhD position waiting for me. So one year passed and I started my PhD (3 year project and now entering the fifth year and still not done). Making a PhD must be the easiest way to enter the real world of jobs. I got a 50% salary (that was how my professor tried to get the people to finish) and made more money than ever before. I was my own boss (kinda) and free in planning my project and experiments plus I got to travel a lot to conferences (Australia, Portugal, etc.) all paid. Everything was fine, I was learning a lot and the taste of freedom is great. 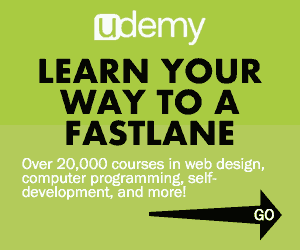 Why would anyone waste time thinking abou the "fastlane" when you are living well. Whenever I talked to friends they we're jealous: "How is that a job? You are just travelling! "; "You are travelling again? "; "I wish I could have a job like this." It felt quite good and that was exactly what was numbing my mind. How foolish. Before my project was ending my professor got into a relationship with a guy that was promising to take the technology, developed in our group and sell it. Typical start-up stuff. My professor was supposed to become director of research and development. From that point everything went kind of fast. Next to my PhD project I started working for this company for some extra cash. Life got better. And then it got worse. My professor was not happy with his partner (actually they were not partners. My professor gave up all his research/results and sold it to this guy for nothing. If only he had the balls to make his own company I guess I would be somewhere else). My professor was looking for other positions at a different university and lo and behold, he found a position (way better university, way more salary, way more power). So he moved away and didn't have time for me anymore. Which basically was causing me to wait for 1.5 years for corrections or any feedback for my PhD. Unfortunately this was only F* It Moments. I transitioned to the newly opened company first for 50% salary to finish my thesis and then full time and the money was finally flowing. I never earned that much money before. It felt great. I was again quite free with my time. The company was small. I was hired as a researcher. But start-ups have problems too. So instead of getting that hard earned cash every month, sometimes it took 3 months before the money was paid. None the less more staff was hired more crap was bought and still the salary didn't come. Stuff was not paid, threats arrived from other companies that we will get sued. The boss was absent, sometimes for months. But in the end the money always came. F* It Moment, after F* It Moment. People started complaining, nobody did anything. Like animals to the slaughterhouse. But still, it was only F* It Moments, nothing that couldn't be handled. Then my daughter was born. The most beautiful, precious thing anybody can imagine (bragging again…). And I thought I was done. It was not just about myself or my wife anymore, it was about my daughter too. No F* It Event happened but I started connecting with some old colleagues (all now working in the same company, since our professor left) and I wanted to start something. However, I think I didn't want it enough because I wanted others to help me, I wanted a "Mastermind Group". While this thinking is correct, it didn't work. I started reading books and publications, checking for something I could make. We are all smart guys with a lot of knowledge and research experience, I thought it would be easy to start something. However, we never made it past 1) since my "Mastermind Group" wanted me to do literally everything. Everyone wanted contracts to be signed, that we split profits even (which f*cking profits???? There was no company...). The others (btw all friends of mine) didn't have time to read books or publications, didn't have any ideas and all the ideas I had were criticized: "How is that supposed to work? "; "That exists already! "; "What is the benefit, I don't think it's a good idea? "; etc. Not really the best motivation. Once I didn't update them anymore, nobody said anything. No enthusiasm, no questions. I guess I didn't deliver anything, so no damage done to them. I grew more and more frustrated doubting myself and my ideas. Entrepreneurial poison. All the while my professor didn't correct my thesis or anything and just used me to give him data to write proposals: "I'm so busy right now, please give me the data, once I wrote this grant I can check your thesis." or "Busy...A lot to do...Will contact you." But I still didn't break. The salary came somewhat regular and humans get used to anything, even if it is you being treated like sh*t (F* It Moment). 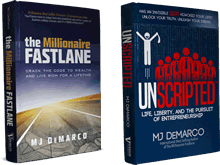 But I still kept reading, watching YouTube videos and by coincidence I found The Millionaire Fastlane, as it was mentioned in a YouTube comment. The book sucked me in, I finished it in a couple of days. I was motivated like never before but I still didn't do anything. It is almost borderline insanity to know what is written in The Millionaire Fastlane and still not do anything. And that leads us to right now. I am 30 years old, almost got my PhD. The highest education possible and still not moving. I picked up Unscripted and again could feel the rise in motivation. My daughter is one year old now and I hate that I have to give her to someone to be watched while I am working (my wife is working in the same company)((In Germany you can stay at home for one year after your kid is born). Now I am trying to find the point of no return, the F* It Event, or if that doesn't happen I will do it without it. I promised myself to change something and it has to be now and not in the future. I will start by myself and I will fail or succeed by myself. I hate my job (I could go on and on what the problems are, but I think I wrote enough for you guys to understand a bit), but I hate my laziness even more. Something has to change, I HAVE TO CHANGE. I know that I will find useful information in this forum and like minded people. If you read this whole thing, thank you for wasting your time on my life, it can't be as bad as the time I wasted by myself. And also know that a high education does not make you smart. Take me for example, I made so many dumb decisions and wasted so much time and energy procrastinating. We never stop learning... And I think as long as you don't give up everything will be fine. I will try my best to succeed and report in this forum. Thank you all for this community. JLST, jon.a, MarcoSto and 2 others like this. Hey Felix, welcome aboard! What do you do at your job, I am asking because my girlfriend want's to study Biotechnology in Germany and I have double thoughts about that?! "trying to find the point of no return" why not create it? Do you have any ideas yet? I am a Software Developer by profession. I am using my programming experience to build a subscription based application. I am moving away from my field of study. I wanted to focus more on the management side of my job in order to get more experience that might be useful for my own company. I specialized in polymer biosensors for cell measurements, basically devices that were meant for a research. Of course some of that could be applied to various fields and that is one thing I am investigating now. As for your girlfriend: I think studying is great, Germany is a very safe country and as mentioned before, studying is quite cheap here. If your girlfriend knows what she wants to study and why I think it is fine if you ask me. But to be completely honest the field is quite competitive and jobs are scarce after the masters (because you are kind of specialized already). I would definitely not recommend to do a PhD unless you want to become a professor afterwards. That being said, I also know a lot of people that are very happy with their jobs after studying. I can also be more specific if you like to follow up with any questions. For my plans: I am setting up a company right now first an internet business which technically doesn't require me to have a business at all to test the idea and create something that is scalable in the future. Other than that I am researching if I can use some of the things I worked on in order to start a company. Anyhow I will start a company to keep myself going and I will try to not give up and wait for the "right moment" or the "right idea". Since failure is part of the game I think I will learn something valuable anyway. Another fellow countryman. Welcome aboard the right ship. May i direct you towards some (hopefully) helpful threads in this forum? GOLD! - 8 Steps That Will Radically Change Your Life in 30 Days or Less, Guaranteed. PhD definitely not, just master. Where did you study? Thank you for the information. I will make sure to contact you if we have any further questions, nice to meet someone with this type of experience! And you speak English which is great (I don't know, but I am having a great deal of trouble finding English speaking people in Germany). Back on you. Be sure to read all the GOLD threads, but be careful not to read too much. Because there is so much content here. Check on this, these are the words from successful forum members. -The general advice online for idea extraction is crap. Basically, here's the easy way to do it when you're starting a business. "What are you spending the most money on?" "What are you overpaying for?" "What are you wasting the most time on?" "What services are you spending the most money on?" "What services do you want but can't buy?" You don't really need any other questions. Just those basic ones to identify where the money and pain is. Figure out a way to meet with the prospects. Ask those questions. Then fill the need. 1. In what space or niche do I personally have the highest probability of success if I dedicate the next 5 years of my life working 12 hours a day, 6 days a week. (Again, this is a personal question which took myself about 6 months to drill down to. You want to be in a space where you have some type of knowledge, possibly a bit a natural talent for. Something that is not trendy, there is not a lot of competition, does not require a ton of upfront capital to get started, etc etc. Take the next 3-6 months and do your research, do not rush this question as it will determine in large part, whether you become successful or not. The last thing you want to do is work your a$$ off for 5 years for nothing because you were too impatient in the beginning and didn't take the time to figure out the best space to compete and ultimately dominate in. Anakalypsi and Felix H like this. I studied at the University of Applied Sciences in Kaiserslautern but I would definitely go to a bigger university with a better campus life if I could do it all again. The bigger the city the higher the probability that the people speak English. Actually there are a lot of American soldiers around so that is not so much of a problem here. I have a pretty good idea of what I can do to serve a need. Basically everything I did for my professional career was solving problems (mainly for research) but with a high potential for real world applications. So at least I am not starting at zero. I will get in contact with some professors I know so that I can use some laboratories (I already got a deal which costs me nothing and I can use the facilities). I will probably get some students to work in a project of mine so that this can run in parallel to my internet business. I already made a plan for some applications that need to be developed into a prototype and then I will check if I can make a patent and approach some business angels. nice intro and interesting story. It feels good not to be the only one. Actually, we are in quite a similar situation in some respects. I'm also 30, German, currently working on my PhD in motivational psychology (habit building) and actually used that research and made a product out of it: A psychometric habit building app ("Grow - Habit Builder" on the AppStore) that uses subscriptions to monetize....hopefully . Actually, I taught myself coding for that in 3 months from scratch - had no money for a developer - using...well...habits for the main part . You might want to check my intro and my execution thread if you want to know more, but I thought we might have an interesting skype call if you are in for that to talk about topics like: Partnering (good friends, horrible business partners), using your PhD for business (I'm still trying to figure out how to do this without appearing to be a bragging bighead with a "Dr." before his name). I just moved in with my girlfriend and we don't have children, yet. I would love to hear in how far your life changed after your first child and if you think you still have enough time for the very intense process of starting a biz. A lot of topics we could chitchat about. Plus, it would be a great opportunity for me to procrastinate my writing for the current research paper . Send me a pm and I'll send you my skype if interested. we can do that. I actually saw your execution thread yesterday already (just coincidence?!). I think you are doing something with a great potential. For me it is amazing, how you went from an idea to your product, very inspirational. I will be in touch. Oh cool. Yeah. Thats a nice little coincidence . Don't get fooled. It was 15 months of pure desert with a lot of doubt, panic, anxiety, coffee and code. Condensed in a post, it appears like it happened in a weekend or so...definitely not . Looking forward to our call. Hey man, why one should have doubts about studying in Germany (other than it's slowlane most of the time ? my ideas are focussed on research I performed. At the moment I got unrestricted access to the laboratories I need. So I don't have to quit my (well paying but hated) job for now. I have to perform some experiments and could get a prototype ready fast and then check where to get some funding. On the other hand I'm trying hard to check for needs that I can provide a solution for. I came up with some ideas that I will gradually try, next to the development of prototypes. Once I decided I will put a progress report out.